The BLVD Market is an opportunity for the community to gather and enjoy an offering of fresh produce and unique items in an open market atmosphere. The Market’s summer hours are 4 – 9 p.m., every Thursday on Lancaster BLVD, between Ehrlich Avenue and Fern Avenue. This area will be closed to traffic and parking from 1 – 11 p.m. on Market days. 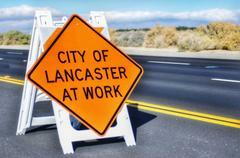 Lane closures on Avenue I, between Fern Avenue and 17th Street West, are associated with the City of Lancaster Avenue I Corridor Improvements project. The scope of work includes street reconstruction; sidewalk, curb and gutter construction and repairs; as well as landscape improvements. 13th Street West will be closed to through traffic across Avenue I; right turns only permitted. On Avenue I, Westbound traffic may not turn left at 15th Street West and Eastbound traffic may not turn left at 10th Street West. Intermittent lane closures are in the vicinity of 10th Street West and Avenue K-8, due to utility and street improvements for the Ram of the West development. Intermittent lane closures on 30th Street East, between Avenue I and Lancaster Blvd., as well as on Avenue I, between 26th Street East and 35th Street East are due to Cole Middle School pedestrian improvements. The scope of work includes concrete and asphalt sidewalks, bulb outs, crosswalks, ADA improvements, bike lanes, and traffic signal improvements. Expect delays and choose alternate routes.